As Experience Designers, understanding these strategies can help us conduct better research resulting in more accurate observations, and design User Interfaces that are easier to use and require less mental effort (i.e. cognitive load). 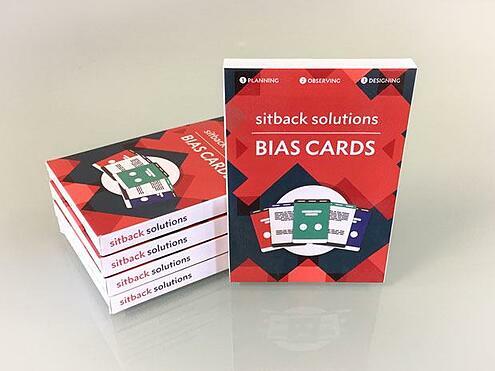 At Sitback, our UX Psychologists have created a set of Bias Cards, summarising 25 common biases that researchers, designer and participants may hold unconsciously. Regularly reviewing these cards reminds us to pay attention to the biases we may have, and react strategically to alleviate them. 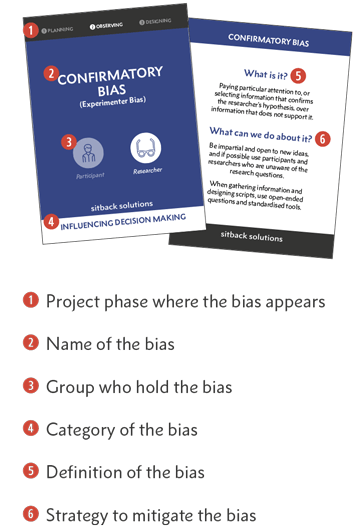 Use the form on the right to download your free Bias Cards pack today and take a step closer to improving your research and design skills! Rather than printing off a set, why not grab yourself the real deal?! Our Bias Cards are available to purchase now from our store.